Use the guide below to install NetVizor on your computer in 10 easy to follow steps. If you have any questions along the way do not hesitate to contact our staff and we will be glad to assist you. 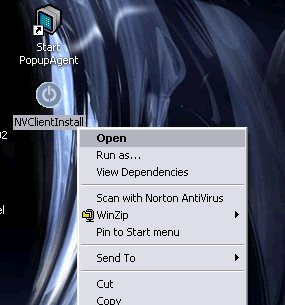 Your first step is to copy the NVClientInstall.exe file to the computer you wish to install NetVizor. Once this is done you can double click the NVClientInstall.exe to begin the install process. The NetVizor installation will only take a few seconds to install - and is done so in total stealth - preconfigured - and monitoring of the computer will begin. 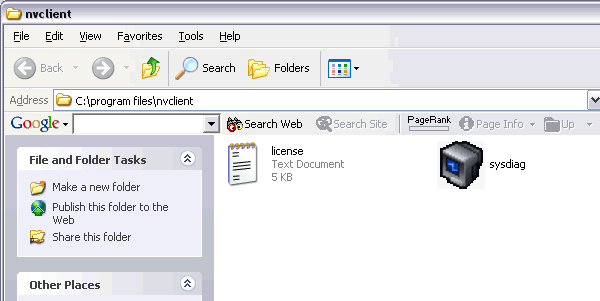 The client is installed in the nvlient program files folder shown below. 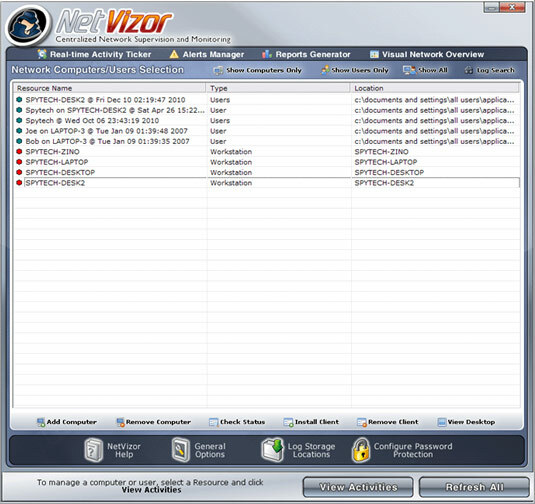 The NetVizor client is already preconfigured to monitor the computer optimally, however, as a network adminstrator you may wish to enable log storage on a server folder so you can monitor network users from a central location without clients being online/active. 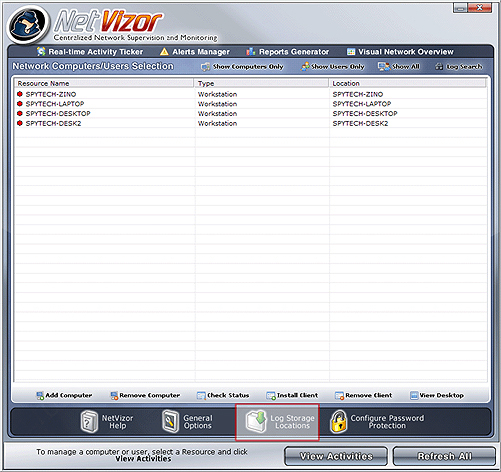 To do so access the NetVizor client by pressing CONTROL+ALT+SHIFT+M, then entering your password. You will need to enter a centralized shared folder that all PC's on your network have read/write access to. This is where each PC's logs will be stored. We recommend naming the shared folder 'logs$' - or a name that ends with a '$' - the $ indicates the folder is hidden on the network - so users will not be able to browse/view it. We also recommend choosing the 'Categorize logs' feature so that the Viewer views this computer's logs categorized by username. 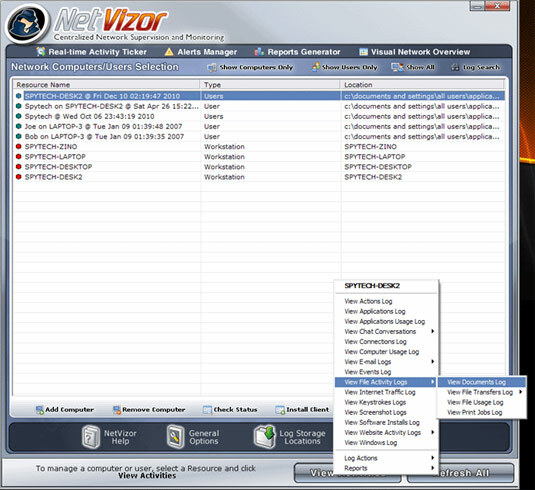 If you choose to not categorize logs you will still be able to view logs for this computer via the NetVizor viewer's interface, but all logs will contain activities for all users on that computer, as opposed to sorting them by username. 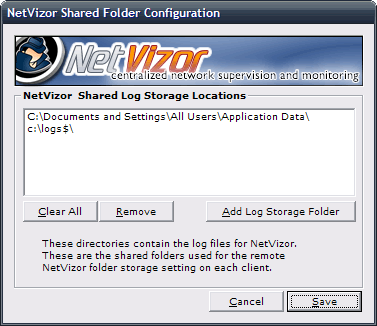 Once you have a shared folder setup, and entered into NetVizor, click OK to save. You will be prompted to restart NetVizor. You can run it from the program files\nvclient\sysdiag.exe location mentioned previously in this install guide or you can reboot the computer. The client is now installed and configured. 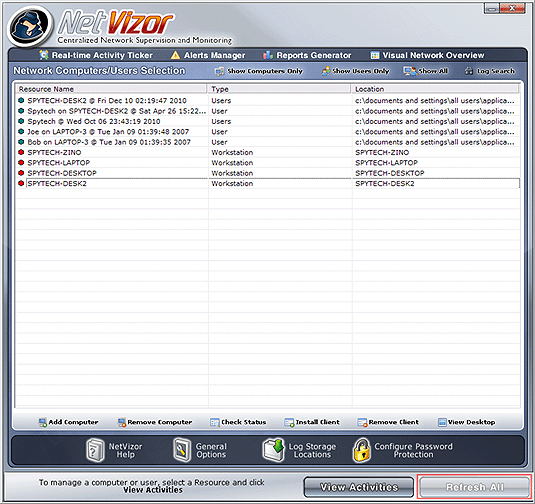 Now that the NetVizor client is configured properly now you will have to setup the viewer (NVViewerInstall.exe) for centralized network viewing. 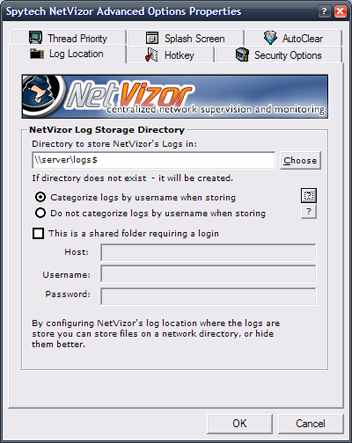 NetVizor will ask you if you want to automatically scan your network for computers to add to the viewer, but you have to configure the viewer to 'see' the shared log storage folder you are storing logs to. Click on Log Storage Locations to start the configuration. This folder is the same folder you configured for the NetVizor client's you previously configured. If the viewer is installed on the PC with the shared folder that is being used for storage then you can use the local path - as shown below. Otherwise you can use the same shared path you used for all of the client's you previously installed. Notice that you can add more than one storage location to this list - this way you can view multiple share locations from multiple subnets and servers. Once you set the folder location click Save to proceed. Click on "Refresh Users" to refresh the Network Users list - this should show all the network users that are being logged by the client's that you installed - as well as PC's on your network. To view a User's activities highlight a username then click the "View Activities" button. You will be presented with a menu to select what activities you wish to view for the remote user. If you need to add additional computers to the NetVizor viewer at any time you can add these computers to the NetVizor viewer by clicking on 'Add Computer' within the viewer. That's it! 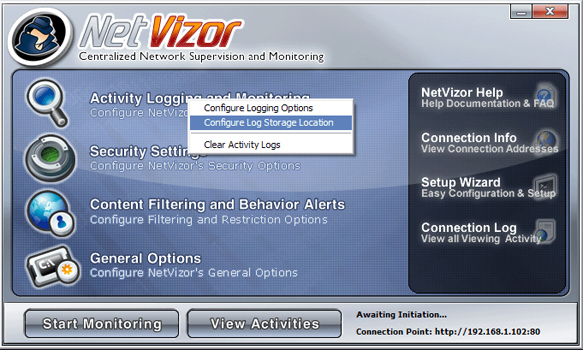 NetVizor should be ready to go for optimal network surveillance! To remotely connect to remote workstations select a computer and click "View Activities". Use the Realtime Activity Ticker and Visual Network Overview features to view network usage in realtime and use the Reports Generator to create detailed reports detailing computer usage on your network.